Natural gas is clean, affordable, reliable, and we believe that it’s the best energy for Ontario’s future. Canadians heard that message a little louder in 2013. We’ve seen a lot of news about natural gas throughout the past year, and combined with other conversations on the subject of energy, Canadians are paying closer attention to Canada’s energy supply. Statistics from Google Think Insights show that Canadian searches for energy information grew significantly in 2013. Searches for “pipeline safety” rose 183% and searches for “what is fracking?” rose 146%. It’s great to see that Canadians are seeking information. Natural gas from a variety of different areas offers a significant opportunity, but it’s important for this country to learn more about this abundant and affordable resource. We had the pleasure of being able to ask MPP Bob Bailey a variety of questions about natural gas. Earlier in the week we shared part one, which featured Bailey’s Bill 97. Here is part two of our Q&A with the Member of Provincial Parliament for Sarnia-Lambton, in which he shares with us how he became interested in the energy sector, and his thoughts on what natural gas can do for Ontarians. Q: How did you become interested in the subject of energy? A: I grew up in Oil Springs, Ontario. The first commercial oil well in North America was established there in 1858, and before becoming MPP for Sarnia-Lambton I worked for more than 30 years in Sarnia-Lambton’s petrochemical industry, so I guess you could say I’ve been around the energy industry my whole life. Sarnia-Lambton usually doesn’t come to mind when people think of the major energy production centres in Canada but locally we produce 40% of all petrochemicals manufactured in the country. Not far from Sarnia is the Union Gas Dawn storage facility, the largest natural gas storage facility in Canada. We are an energy hub at the heart of the Great Lakes Region. It’s really impossible to live in Sarnia-Lambton without grasping the importance of energy production and the energy industry. Q: What have other provinces done to spur the adoption of natural gas for industry? A: B.C. and Alberta have worked to accommodate LNG vehicles on their important transportation corridors. Quebec has supported the private development of infrastructure and already has dedicated heavy duty natural gas vehicle fleets doing business in the province. I’d like to see that economic activity extended right along the Quebec City-Windsor corridor and to the west. Q: What might it all mean for the Ontario jobs picture? A: Business in Ontario is tough right now. Costs are rising and operating margins are getting tighter. There are a lot of factors that eat into a business’s profitability and ability to compete over the long run. Certainly transportation costs are one of those increasing business expenses. Natural gas as a transportation fuel represents a 30% cost savings for business compared to traditional fuels. It’s not the perfect solution for every business, but it will make a lot of sense for many companies out there. Natural Gas transportation fuels give companies looking for a competitive advantage a great tool, and a way to cut costs while growing their business and creating jobs right here in Ontario. Q: What are your thoughts on how natural gas can help Ontarians in other sectors and applications? A: I would like the see the industry grow. I’d like to see natural gas infrastructure expanded so that more residents and businesses in rural Ontario have access to such efficient and affordable energy resource. Increased access across Ontario could be a real boon for our agriculture sector. The agri-food industry in Ontario is big business, but not every farmer or producer has access to natural gas the way Ontario’s urban areas do. The affordability of natural gas could make a major difference for Ontario farmers and food producers, growing the industry and helping producers reach new and emerging markets. Q: What prompted you to introduce your private member’s bill, the Natural Gas Superhighway Act, 2013? A: Over the years I’ve met with a lot of leaders to discuss the opportunities to grow the gas industry in Ontario and how natural gas specifically could be leveraged by the province and become a catalyst for economic growth. When I started to look at the way business was being affected by the rising energy prices in the province I knew there had to be a simple way to help businesses regain some of the competitive advantage that they had in Ontario for so many years. Q: What made you realize that there was an opportunity here for the transportation sector? A: I was lucky enough to attend an oil & gas industry conference in Quebec last winter. At the conference the presenters put up a map of North America showing all the places where private investment was developing natural gas for transportation infrastructure; all of Ontario, and most of Canada for that matter, was blank. I knew right then that this was an idea I wanted to promote in Ontario. I knew if we could open up Ontario’s market to investment along Ontario’s portion of the Quebec City-Windsor corridor the businesses and the residents of this province could reap some huge economic and environmental benefits. Q: What are some of the key elements to the proposed legislation? How would they help the transportation industry? A: I drafted Bill 97 with two key elements. First, provide a small incentive to help mitigate the cost of transitioning from traditional to new natural gas specific engine equipment. Converting a fleet of vehicles is capital intensive, but the payback is there in two to three years time. Second, increase the maximum weight allowance for heavy duty vehicles just slightly to accommodate the extra weight of the equipment necessary to run LNG engines. The benefit to the public of these two changes is that the use of natural gas as a transportation fuel would slash the amount of greenhouse gas emissions that the on road heavy duty transportation sector produces each year. The potential to reduce harmful emissions is so great, I think this is something the transportation industry could really embrace and promote. Q: In your opinion, is natural gas a viable alternative for other sectors such as consumer automobiles? A: There are always opportunities for advancements in technology; hopefully this is something that the automobile manufacturers and the natural gas industry are examining. I’m focused on the heavy duty segment because this group only makes up 3% of the vehicles on the road, but they contribute more than 27% of the greenhouse gas emissions in the province that come from the on road transportation sector. 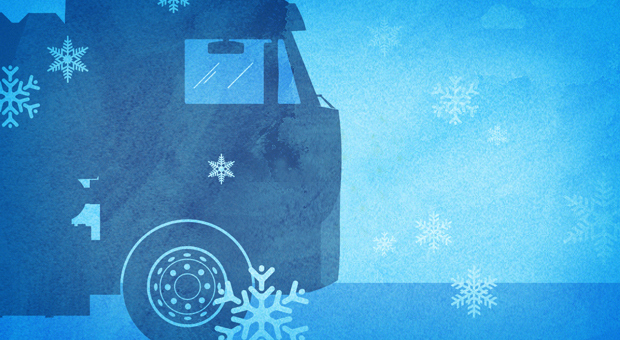 The federal government’s recent report, Evaluation of the Winter Performance of Compressed Natural Gas Refuse Trucks, has confirmed what this blog has believed all along: natural gas trucks perform well, in even the harshest Canadian cold-weather conditions. Demonstrating the practical applications of natural gas, while also instituting new heavy vehicle emission standards for heavy vehicles, is a priority for Transport Canada. That’s why they documented and studied the cold-weather operation of a compressed natural gas refuse truck fleet – 18 Peterbilt trucks with Cummins Westport 8.9 litre engines, in all – owned and operated by EBI (a Berthierville, Quebec-based company). The study also tracked a 58-vehicle CNG fleet of refuse trucks operating in Winnipeg by Emterra Environmental. The real-world experience of one of Canada’s first heavy natural gas fleets was documented. EBI has been operating the trucks for over two years, at winter temperatures as low as -16ºC. The report found that CNG trucks operate well, with no issues in cold weather, provided normal winter aids are used and the vehicle’s design is suitable for cold weather. In fact, they were so suitable that EBI has since gone on to purchase another 32 natural gas trucks for their performance, emissions benefits, and their fuel savings over diesel. “More private-sector investments like EBI’s should be encouraged as they accelerate the transition to lower emission vehicle use in Canada,” says Alicia Milner, President of the Canadian Natural Gas Vehicle Alliance. Do you feel natural gas holds the key to a cleaner, more affordable and reliable future for heavy transport? Let us know in the comments section provided below.